There's nothing like getting a little something that makes you happy in your mailbox, eh? I subscribe to Creating Keepsakes and Simple Scrapbooks magazines and they BOTH came today! Happiness x 2! I scanned them both and can't wait to go through each of them with a fine tooth comb! I love the fall and holiday LO's and the special tools issue of SS looks great - lots of recommendations and how-tos. I'll look forward to catching a few moments over the next couple of days to read more. M'm M'm Good, by Noreen Smith. 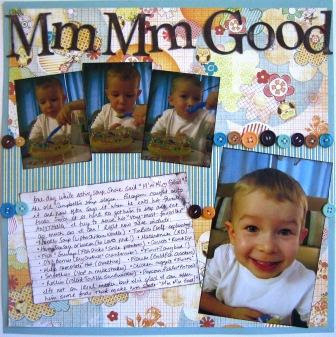 12 x 12 Layout. Paperbilities Cardstock, Sassafrass Lass patterned paper, Stampin' Up ink, Creating Keepsakes/Lisa Bearnson chipboard letters, unknown buttons and index card. The competition is fierce and the work posted is nothing short of inspired! I'm pretty sure mine won't stand up to it! But over the next 5 weeks we will create and share 5 new LO's, so that in and of itself is good! And I do love the photos of Grayson here...he could be a modern Campbell's kid don't you think? OK...I'm biased!!! Went to visit with mom today and as I looked around her room I realized that there aren't a lot of current photos of us. I need to work on a little album or some framed pieces for her. There is some research out there about the therapuetic effects of scrapbooking for Alzheimers patients and although I know she won't actually scrapbook, she always did love looking at our albums. And I do need to get caught up on sweet Sammy's baby book. I create calendar pages for each month where I can record milestones and adventures as they happen, so I need to update October's page. We have been so busy doing things that I haven't been able to record them all! It's so nice to have a little bit of time to devote to scrapping again! Your creative products look great. and I love the layouts with your boys! take care, you and the fam!